I believe that all peace begins with us. We are each responsible for teaching peace and living it. 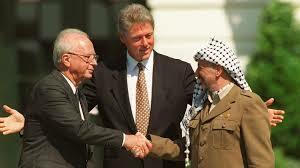 On this day in 1993 an Israeli and Palestinian Peace Accord was signed. That just shows you how illusive peace can be. After decades of bloody animosity, representatives of Israel and Palestine met on the South Lawn of the White House and sign a framework for peace. The “Declaration of Principles” was the first agreement between the Israelis and Palestinians towards ending their conflict and sharing the holy land between the River Jordan and the Mediterranean Sea that they both claim as their homeland. Fighting between Jews and Arabs in Palestine dates back to the 1920s (or even biblical times) when both groups laid claim to the British-controlled territory. The Jews were recent emigrants from Europe and Russia who came to the ancient homeland of the Jews to establish a Jewish national state. The native Arabs (not yet called Palestinians) sought to stop Jewish immigration and set up a secular Palestinian state. But in 1948, the State of Israel was formed, and five Arab nations attacked. And on and on it goes. The middle east is a powder keg of hatred and small tribal elements divided by sectarian differences within Islam, Christianity, and Jews. Ideas have been floated, negotiations have been held, wars have been fought, and yet no solution is found because peace is beaten out of people by hate. The New Testament records Jesus reaction as he approached Jerusalem, “As he came near and saw the city, he wept over it, saying, ‘If you, even you, had only recognized on this day the things that make for peace! But now they are hidden from your eyes.’ “ Luke 19:41-42 I guess that is something I will leave for another time. What makes for peace? You might want to personally explore that one. What does it mean to personally work for peace? How do you live it and teach it? This entry was posted in denny meyer, life coach, sabbath, Spiritual Coach - Denny Meyer, spiritual coaching and tagged coach denny meyer, denny meyer, pastor dennis meyer, spiritual coach, spiritual coach denny meyer, spiritual coaching. Bookmark the permalink.